"Insecticides work; they kill insects. Fungicides have been largely overlooked because they are not targeted for insects, but fungicides may not be quite as benign - toward bumblebees - as we once thought. This surprised us," said Scott McArt, assistant professor of entomology and the lead author on a new study published Nov. 15 in the journal Proceedings of the Royal Society B. While science has studied insecticides, such as neonicotinoids, that attack bugs' central nervous systems, this new work shows how fungicides - particularly chlorothalonil, a general-use fungicide often found in bumblebee and honeybee hives - may negatively affect bee health, said McArt, a fellow at Cornell's Atkinson Center for a Sustainable Future. While fungicides control plant pathogens in crops, the bees pick up their residue when foraging for pollen and nectar. As farms use both insecticides and fungicides, the scientists worry about synergy. "While most fungicides are relatively nontoxic to bees, many are known to interact synergistically with insecticides, greatly increasing their toxicity to the bees," McArt said. Chlorothalonil has been linked to stunted colony growth in bumblebees and an increased vulnerability to Nosema, a fatal gut infection in bumblebees and honeybees. "Nosema can be devastating to bumblebees and honeybees," said McArt. "Since fungicide exposure can increase susceptibility of bees to Nosema, this may be the reason we're seeing links between fungicide exposure, Nosema prevalence and bumblebee declines across the United States in this data set." 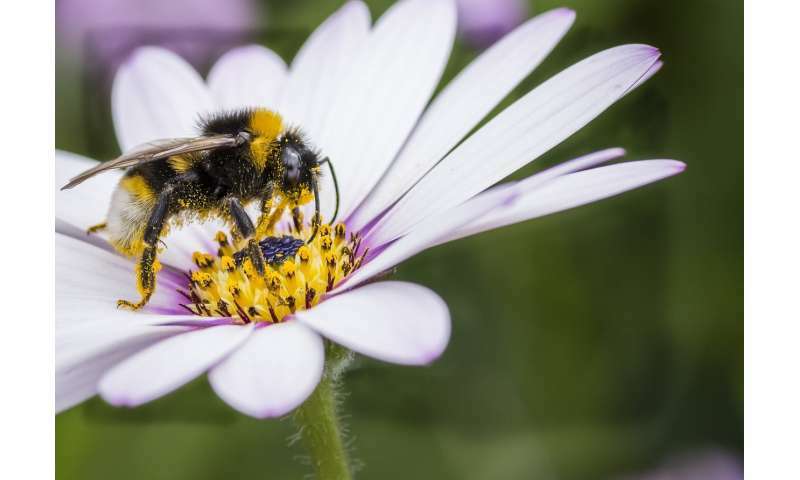 For domestic and global agriculture, bumblebees are a key component due to their ability to use "buzz pollination" that vibrates and shakes pollen loose from flowers. In the United States, bees contribute more than $15 billion to the economy and $170 billion to global agribusiness, according to global economic research and a 2012 Cornell study. While half of crop pollination work is done by commercially managed honeybees in the U.S., the other half is done by bumblebees and wild bees. In New York, pollination services contribute $500 million to the state's agricultural economy.